With its conversion complete, the story of the Aerial Lift Bridge—as with the Aerial Transfer Bridge or any man-made structure—became one of maintenance and incidents. The first such event occurred in May 1930. As W. J. Odenthal of Killdeer, North Dakota, and his son were driving north across the bridge in the brand-new car he had just purchased, the bridge began rising to allow a freighter to pass. Mr. Odenthal hadn’t noticed the stop signs and warning bells telling him to stay off the bridge; while pointing out the sites to his son he had managed to drive past the gate before it dropped. When he reached the end of the span, he continued to drive straight off the bridge and, luckily, onto the pier below. Neither he nor his son were injured, but the car was totaled. Safety measures were later added, including gates at either approach to prevent cars from reaching the bridge. When preparing for a lift, warning bells go off and the entry gates close; once all cars have cleared the bridge, a set of departure gates closes behind them. Only after all four gates are closed does an electric relay allow power to the operating handle, ensuring that the bridge would no longer lift with a car on its deck. The bridge operators could perhaps understand how Mr. Odenthal didn’t hear the bell: they knew firsthand how the canal could play tricks with sound. Less than two weeks earlier, all six bridge operators—employees of the KCBC and the former transfer bridge operators they were training—failed to hear the whistle of the steamer L. M. Bowers requesting a lift. The Bowers’ captain leaned on the whistle, and it was screaming as he split the piers and entered the canal, all the while trying to reverse course to avoid hitting the bridge. Fortunately, an operator happened to look lakeward in time to quickly raise the bridge and avoid a potential tragedy. The problem was wind. Depending on conditions and direction, the wind sometimes prevented sound off the lake from reaching the operators house over the canal’s center—a sound blind spot, if you will. Green ordered that one operator constantly scan the lakeward horizon until he found a more practical solution. By December the problem had not been fixed, but it was being addressed. On December 5 the Duluth News Tribune announced that Duluth’s Aerial Lift Bridge would become “the nation’s experimental station during the shipping season of 1931 when city commissioners will seek development of a system to warn bridge tenders of approaching ships in a storm or fog.” Various companies were invited to experiment and submit ideas for radio sets, “electronic eyes,” or any other device that would report a vessel’s approach. 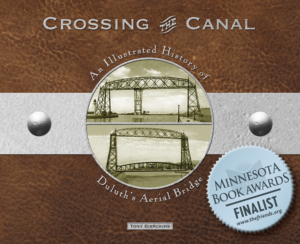 Over three hundred lift bridges were operating in the United States at the time, many located on canals and rivers with similar sound problems; all eyes—and ears—would be on Duluth. Sadly, young men on the piers were involved in far more dangerous escapades, like trying to hitch a ride on the bridge—a problem that has plagued the operators since the bridge first lifted. In 1934, seventeen-year-old Melvin Halverson, about to begin his senior year at Denfeld High School in West Duluth, grabbed the edge of a beam on the bottom of the span and held on as the bridge began to rise. A person can support his or her own body weight only so long, and Halverson’s grip was fleeting at best. His arms gave out when he was thirty feet in the air. He fell to the pier, hit his head on the concrete, and died instantly. The next year another near miss with a vessel prompted more safety initiatives. On June 17 the steamer Schoonmaker just missed striking the bridge, which had stopped seventy-five feet above the water when a circuit in the electric system had shorted out. Operators quickly started the emergency engines and lifted clear of the steamer. But they had been lucky: because of ongoing dredging in the canal, the Schoonmaker was traveling slower than normal. If she had been moving at normal speed a collision would have been unavoidable. Rules were changed, requiring operators to raise the bridge while the vessel was much further out, in case the bridge became disabled in any way. The change allowed more time to either fix the problem or reverse the vessel. The city also purchased an electronic failure warning system. World War II dominated the bridge’s life in the 1940s. Steel fueled the war effort, and iron ore came from Minnesota’s iron ranges. 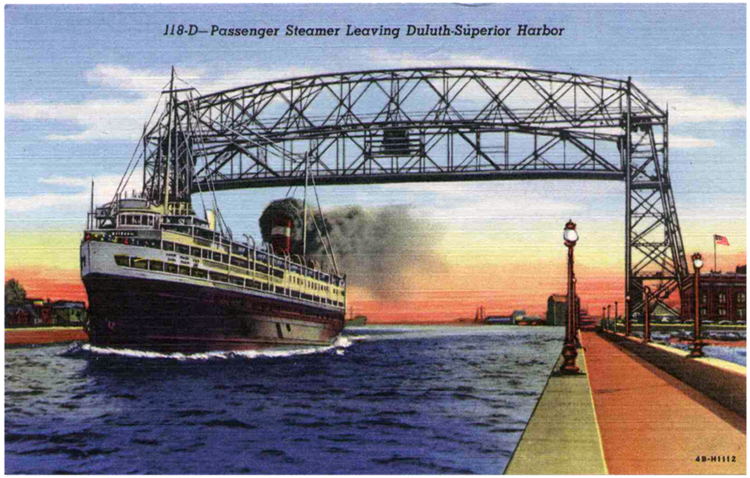 That ore was shipped through Two Harbors and Duluth, and each ore boat loading in Duluth came and went through the ship canal. Between 1941 and 1945, the bridge lifted nearly thirty thousand times for marine traffic, averaging six hundred more lifts per year than the total average of lifts of each year from 1930 to 2005. It wouldn’t see those levels again until well after the St. Lawrence Seaway opened in 1959, making Duluth-Superior an international port. The Twin Ports war effort wasn’t limited to shipping ore. Duluth and Superior became a center of shipbuilding, temporarily reviving an industry that had largely died out after World War I. Throughout World War II, the Twin Ports’ eight shipyards employed over ten thousand men and women, averaging 10 ships a month while producing a fleet of 230 vessels. Zenith Dredge made 8 tankers and 13 cutters; Superior’s Butler Shipyards built 13 coastal freighters, 12 frigates, and 7 cargo carriers; Globe delivered 8 frigates and 10 ocean-going tugs; Marine Iron and Shipbuilding supplied the Coast Guard with 18 cutters; and 13 plane-rearming boats and 4 sub-chasers came out of Inland Waterways. Together Scott Graff Lumber Company and Industrial Construction Company built 100 landing barges. Most of the ships left the Twin Ports through the ship canal. In 1944 the City Council looked into allowing rides for sightseers, an idea that would arise periodically throughout the bridge’s life. Commissioner of Public Works Francis C. Daugherty thought it was a swell idea, because a fee for rides could help pay the bridge’s operating costs, which consumed $24,000 annually in salaries, power, and maintenance, along with other occasional major expenditures, such as when the bridge’s gears were replaced in 1949. But the ride idea was deemed too risky, as it exposed the city to potential liability lawsuits. Sadly, 1944 also witnessed the passing of the aerial bridge’s first and longest-serving superintendent, Leonard Green, who died of a stroke. Frank Lampert, who had worked as a bridge operator since before the lift conversion, delayed his own retirement an took over as interim superintendent before Al Hass officially took over in 1948.